Women’s slide sandals can be one of the most comfortable types of footwear to wear. Not only are they easy to get on and off, but they also let your feet breath and in a lot of cases feel like you are wearing slippers. 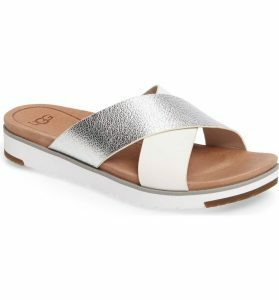 We have found the best and most popular women’s slides, both in athletic and fashion styles, for you to have a browse through, so you shouldn’t have any trouble finding a comfy pair whether you are looking for something sporty or a more classic, elegant design. The Nike Benassi JDI Slide is one of the all-time most popular slide sandals for comfort that you are going to find. They are relatively fashionable, although the style isn’t for everyone. If you are looking for something to wear around the house, this one can’t be beaten as far as pure comfort. If you are a fan of Nike, you will love that the Benassi is inexpensive and durable so that you will get many years of wear out of them. The wide strap makes it easy to wear with or without socks, and your foot won’t slip off or to the side of the shoe. If you are looking for shower sandals, this style isn’t the best as it has an absorbent material on the inner part of the strap that is nicely cushioned, but it takes a while to dry once it gets wet. The sole and midsole are a combo of rubber and Phylon, so they are really light, flexible, and super cushioned as well. The material is also easy to wash off or wipe clean. The Benassi comes in a good range of exciting color combos, so there is something for everyone’s tastes. This Nike design probably isn’t the best style if you are planning on walking long distances, but as a pool sandal or a house slipper, these are a great option. The Birkenstock Arizona is another trendy option if you want a comfortable and easy to get on and off summer option. Sometimes slides can be a little hard to keep on if they have just one strap, the Arizona avoids this by having two wide straps that make it easy to walk in without the fear of falling out of the shoe. The straps also have buckles that you can adjust for a more precise fit. Birkenstocks are known for their excellent footbeds, and this style comes in a regular or a soft bed. The difference is the soft footbed has a layer of foam that gives the insole a little bit more cushioning. Whichever footbed you choose, there is a little bit of a break in period with these sandals, but once the insole has been molded to the shape of your foot, it will become one of the most comfortable shoes that you own. The good thing about Birkenstocks is that with a little bit of care they get better with age and wear. 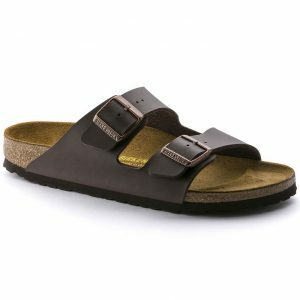 Birkenstocks are a bit pricey, but everything about this shoe, including the leather, the buckle, and the footbed is very high quality and durable. Clarks is always a reliable brand for comfortable footwear, and one of their best slip-on options is the Lexi Myrtle. This design provides excellent arch support with a nicely cushioned footbed. It comes in a variety of colors with a flower embellishment on the upper part of the shoe. They are a pretty design for those that have plantar fasciitis that find it difficult to find fashionable styles that also have good support. As far as comfort there is no need to break them in as the cushioning, and the leather is soft enough that most women can wear this style right out of the box. One feature on this heeled style that makes it especially easy to wear is that the positioning of the straps means it will stay on your feet when you are walking, which can sometimes be an issue with shoes that have no heel. The UGG Kari is an attractive, comfy and nicely designed shoe. The straps are made with high quality, yet soft leather, and it comes in two-toned colors that will go with almost anything. They have a very squishy foam sole that is designed for comfort so that they can be worn right out of the box with no break in period. The wide straps are also positioned in such a way that your foot won’t slip off the sole when you are walking. There isn’t much arch support in the Kari, but the footbed is very comfy if you don’t need arch support. Like most UGG footwear, the materials are high quality and the shoes are very well made. 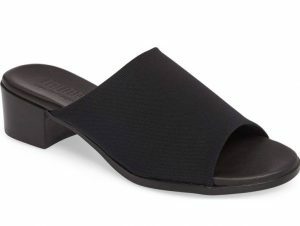 The OOFOS OOahh Slide Sandal is often recommended by podiatrists for those with plantar fasciitis, but it also great for anyone who values comfort. It is another style that works well as a house shoe, partly because they are unbelievably comfy and partly because they aren’t the most attractive style, so a lot of women don’t like to wear them out of the house. Despite being somewhat ugly, what people love about the OOFOS OOahh is that they are cushy, lightweight, and have outstanding arch support. One downside to this design is that there are no half sizes so it may be a little tricky to get the right fit over the arch. The OOFOS OOahh comes in navy, slate, and black. Adidas have many different styles of slides to choose from, with one of the most comfortable being the Adilette CF Ultra. It has a Cloudfoam ultra footbed and a lightweight Eva outsole, which means they are super soft although they are slightly bulky because of the Cloudfoam. The strap is also quite padded, so that helps add to the comfort of the shoe and helps it to stay on. The sizing can run a little big on the Adilette CF Ultra so read the sizing guidelines carefully. This style works great as a house shoe or a pool shoe, but you can also wear it out and about. There are various versions of the Adilette, some with less padding in the footbed, so make sure you are looking at the Performance Women’s Adilette CF Ultra if you are interested in getting the most comfortable style. Munro Shoes are a brand that is known for its fashionable, yet comfortable styles. The Munro Beth is a relatively simple design with a 1 3/4″ heel, and a slight 1/2″ platform. The strap is a stretchy material that is wide enough that it helps the shoe to stay on the foot and prevent that clunky sound that you can sometimes get with heeled slides when you walk. The footbed has a moderate arch and is slightly padded for a cushioned feel. Overall it is a stylish and easy to wear style that will go well with pants, skirts or dresses. The height of the block heel means you can wear them for casual or dressy and they will look good either way. The SoftWalk Tillman is a comfy and cute style that works exceptionally well for wide feet. If your feet aren’t wide, this style is probably best avoided. The Tillman is a well-made design that features a low-heel and a well-padded footbed. They are relatively stylish for a comfort brand, and they come in several attractive colors. You can dress this style up or down depending on the outfit. They a durable shoe that will stand up well to everyday wear, but be aware that the width on the Tillman is very wide. A more sporty looking option is the Teva Women’s Tirra. The Tirra is an excellent design if you need a slide that you can get wet. The upper is extremely durable and dries quickly after being exposed to water. It has adjustable hook-and-loop closure that will allow you to get the most comfortable fit by adjusting the Velcro. The footbed is also insanely comfortable due to the comfort features of a contoured EVA footbed and a cushioned Shoc Pad™ in the heel. What this shoe has that you don’t find on a lot of summer slides is excellent traction on the outsole of the shoe so that you won’t be slipping in wet conditions. Overall the Tirra has good arch support, is pretty sturdy and the way that the straps are designed means that you won’t slip out of them very easily. It is also easy to clean and very durable, so they can be worn in all kinds of weather and conditions without worrying that you will ruin them. Another style that is similar to the Teva Tirra is the Merrell Terran Slide II. The Terran is another favorite athletic shoe that can be worn in more challenging conditions that an average summer slide, because of the excellent grip and traction on the outsole of the design. It comes in a wide array of lovely colors that hold up well to wear without fading. The upper is made of a mix of Nubuck leather upper and Lycra neoprene. Most women find that they are super easy to get on and off, but stay on well when you are walking in them. They have a soft footbed that is covered in microfiber fabric, and the heel also has extra air cushioning like the Teva design. Unfortunately, the Terran II doesn’t come in half sizes, so you may not be able to get the exact fit that you want, but the overall comfort level of this style is pretty good for most women. 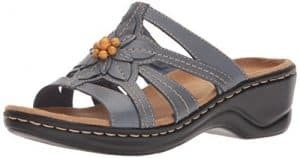 For those who are looking for a simple, low heeled design that is perfect for dressing up or down, you should check out the Naturalizer Mason Slide Sandals. The Mason is a high-quality option made from soft leather, that includes lighter and metallic colored options. The footbed has something called N5 Contour technology which means that it has a contoured comfort footbed, that will provide support, breath-ability, and padding. If you put all that together, you can rest assured that this is a comfy slide. The sole also has a good rubber grip that will prevent slipping in wet conditions. The Mason is a versatile and straightforward style, that will look good with shorts, pants, and casual dresses. A lot of women who have plantar fasciitis love these VIONIC Samoa because they are supportive and still comfortable. They don’t require any break in time so that you can wear them right away. The two straps are leather and are adjustable with Velcro fastener, so it is straightforward to adjust if you need to. The footbed is very cushioned with a flexible EVA midsole, and they feature good arch support for those who need it. It is also a style that is easy to get on and off quickly and easily, so they are great as a house shoe, in addition to a shoe that you can wear out. 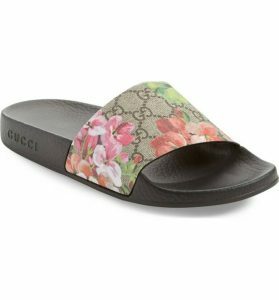 If you like your shoes to be a designer style, you may want to check out these cute and fashionable Gucci Pursuit Slide Sandal. They have a fabric strap with the Gucci logo mixed with a pretty floral pattern. The sole itself is very well cushioned and will mold to your feet for custom comfort. They are very pricey, but they are made in Italy and are designer. You can wear this style with lots of different spring and summertime looks, although this slide isn’t intended to be worn for walking long distances. Under Armour do an excellent job on the cushioning of their flip-flops and sandals both for men and women and the Ignite VII is no exception. It comes in a nice variety of color combinations, and the strap is adjustable so that you can get the best fit. It is another style that is much-loved as a house shoe, because of the super comfortable footbed but also the ease of getting the Ignite off and on. It has a little bit of arch support, along with the excellent cushioning. The outsole is non-slip with a good grip.